Researchers at MIT have discovered an Earth-sized exoplanet named Kepler 78b that whips around its host star in a mere 8.5 hours—one of the shortest orbital periods ever detected. 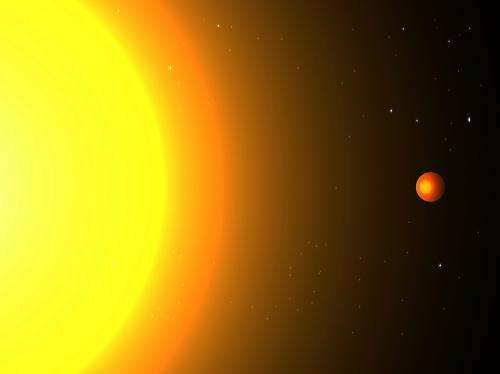 The planet is extremely close to its star—its orbital radius is only about three times the radius of the star—and the scientists have estimated that its surface temperatures may be as high as 3,000 degrees Kelvin, or more than 5,000 degrees Fahrenheit. In such a scorching environment, the top layer of the planet is likely completely melted, creating a massive, roiling ocean of lava. What's most exciting to scientists is that they were able to detect light emitted by the planet—the first time that researchers have been able to do so for an exoplanet as small as Kepler 78b. This light, once analyzed with larger telescopes, may give scientists detailed information about the planet's surface composition and reflective properties. Kepler 78b is so close to its star that scientists hope to measure its gravitational influence on the star. Such information may be used to measure the planet's mass, which could make Kepler 78b the first Earth-sized planet outside our own solar system whose mass is known. In a separate paper, published in Astrophysical Journal Letters, members of that same group, along with others at MIT and elsewhere, observed KOI 1843.03, a previously discovered exoplanet with an even shorter orbital period: just 4 1/4 hours. The group, led by physics professor emeritus Saul Rappaport, determined that in order for the planet to maintain its extremely tight orbit around its star, it would have to be incredibly dense, made almost entirely of iron—otherwise, the immense tidal forces from the nearby star would rip the planet to pieces. "Just the fact that it's able to survive there implies that it's very dense," says Josh Winn, an associate professor of physics at MIT, and co-author on both papers. "Whether nature actually makes planets that are dense enough to survive even closer in, that's an open question, and would be even more amazing." "We've gotten used to planets having orbits of a few days," Winn says. "But we wondered, what about a few hours? Is that even possible? And sure enough, there are some out there." The group was able to detect the light given off by the planet by measuring the amount by which the overall light dimmed each time the planet passed behind the star. The researchers posit that the planet's light is possibly a combination of radiation from its heated surface and light reflected by surface materials, such as lava and atmospheric vapor. "I was just looking by eye, and all of a sudden I see this extra drop of light right when it was expected, and it was really beautiful," Sanchis-Ojeda recalls. "I thought, we're actually seeing the light from the planet. It was a really exciting moment." From their measurements of Kepler 78b, the team determined that the planet is about 40 times closer to its star than Mercury is to our sun. The star around which Kepler 78b orbits is likely relatively young, as it rotates more than twice as fast as the sun—a sign that the star has not had as much time to slow down. "You'd have to really stretch your imagination to imagine living on a lava world," Winn says. "We certainly wouldn't survive there." But this doesn't entirely rule out the possibility of other habitable, short-period planets. Winn's group is now looking for exoplanets that orbit brown dwarfs—cold, almost-dead stars that somehow failed to ignite. "If you're around one of those brown dwarfs, then you can get as close in as just a few days," Winn says. "It would still be habitable, at the right temperature." How common are earths around small stars? The existence of any exoplanet -even a hot one- implies the existence of many others orbiting the same star (even if only one of them has an orbit that makes it detectable by the method used by Kepler). Yes, and yes to both of those comments. I totally agree. I would add that the Kepler method only finds planets which eclipse the star. Our solar system has its planets fairly well-aligned along the ecliptic. We have no way of knowing how common or uncommon this is. The majority of systems 'could' have planets with oblique orbits, so we would only be able to observe a portion of the planets around any given star, even if we're lined up with their ecliptic. We could still be greatly under-estimating the number of planets around an average star. I wouldn't go so far as "implies". It may up the likelyhood a bit. But planets can also be ones captured by the star in question later on. The closenes of the star doesn't give a clue as to its ultimate origin. I hate to be the one to point this out, but it's really bugging me. The article says, "and the scientists have estimated that its surface temperatures may be as high as 3,000 degrees Kelvin, or more than 5,000 degrees Fahrenheit." Because the Kelvin scale is not measured in degrees, it should say 3,000 Kelvin, not 3,000 DEGREES Kelvin. If the planet were tidally locked, the side facing away from the sun would be cooler. Assuming he could work out a safe way to approach the planet, an visitor could set himself up on the back side and literally watch the stars fly by.